Vivien Chen, MPH, PhD, earned her BS in Biology from Hong Kong Baptist College in 1969. She completed her MPH studies in Community Health from the University of Oklahoma College of Health in 1973. 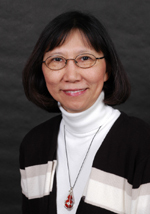 Dr. Chen completed her PhD studies in Epidemiology from the University of Oklahoma School of Public Health in 1978. She is a Professor within the School of Public Health, where she serves as Director of both the Epidemiology Program and LA Tumor Registry. Her research interests include cancer epidemiology, female cancers, cancer in minority populations, and cancer registration.